This fun couple had a blast taking their romantic wedding portraits on the beach! 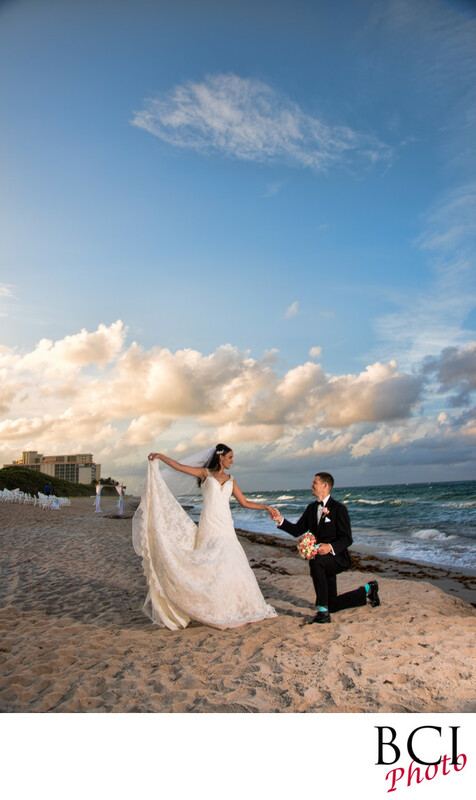 We even got them to have their "first dance" right on the beach! What a great couple they were to go along, and what amazing images that allowed us to capture for them. Here also illustrates our dynamic off camera portrait lighting we use on location so that the picture...can be seen the same way the actual scene looked. Most photographers would simple take what they got which in this case would have required the sky being totally blown out white and all the detail in the ocean lost in order to get their faces exposed correctly. We remove that entirely, but simply bringing their exposure levels up to match the levels of the existing light behind them. Voila....perfecto.